This part is our chelator MymTsfGFP (BBa_K1980003) expressed from this copper-sensitive promoter pCopA with the regulator of pCopA (CueR) expressed divergent from the promotor (BBa_K1980006). Four biological repeats of this part at ten different copper concentrations were measured as well as four repeats of a negative control (The NC part from the interlab study) and a positive control (The constitutive GFP expressing, PC part from the Interlab study). Separately MymTsfGFP was cloned from Gblock (BBa_K1980002) into the shipping vector then transferred it into the pBAD, arabinose-inducible commercial expression vector. We were unable however to detect a drop in solution copper concentration due to copper chelation activity of MymT when expressed from pBAD in MG1655 E. coli strain, using an absorbance assay. Performing a similar procedure with this part also showed no measurable drop in copper concentration. We purified MymTsfGFP using Nickel affinity chromatography followed by dialysis. However were unable to detect copper chelation with the assay in our purified extracts when compared to a his-tagged GFP control. This is possibly because the flexible linked was susceptible to cleavage by proteases in the lysate meaning the protein we purified lacked the chelator portion. 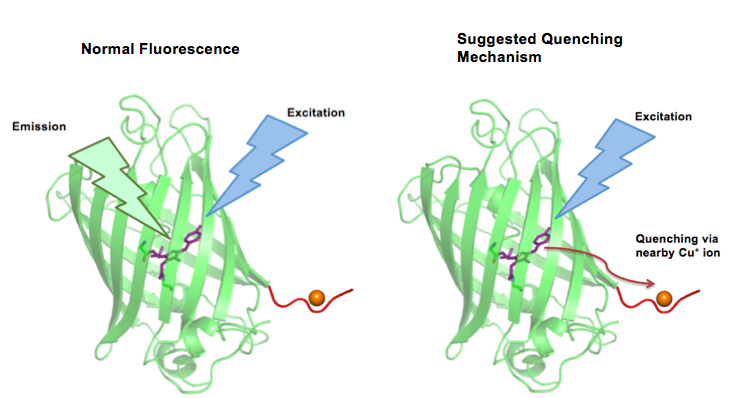 We discovered a paper by Hötzer et al(4) that described how His-tagged GFP can be quenched by a copper ion binding to this His tag leading to a reduction in the fluorescence lifetime (the time the fluorophore spends in the excited state before returning to the ground state by emitting a photon.) They speculated that this could potentially be used as a in vivo copper assay. Although we were unable to demonstrate the ability of this system to buffer free copper concentration we believe that this is because the range of concentrations over which the system operates is below the detection limit of our absorbance assay. Future work should be done to optimise the system so it can operate over a wider range of copper concentrations. This could possibly be done by changing the promoter sequence or the RBS strengths. We are please that the FLIM data we received suggests copper binding in vivo. With more time we would generate a standard curve of fluoresence lifetime at different copper concentrations so this could be quantitative. We would like to refine our protein purification and copper BCS assay techniques to hopefully so activity through this method.